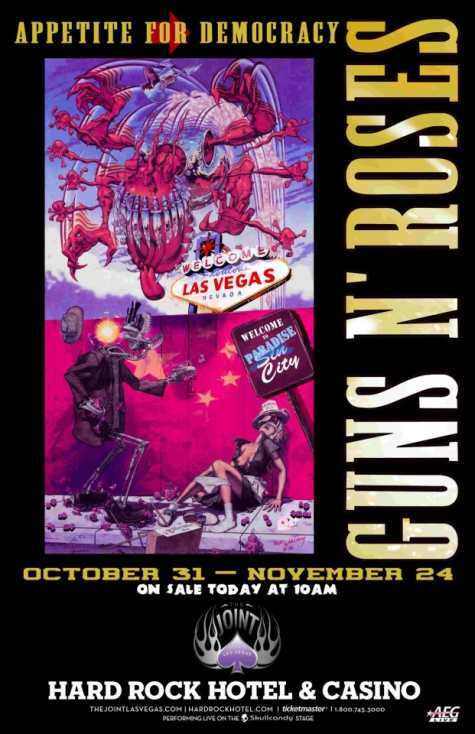 Guns N’ Roses kick off their “Appetite For Democracy” residency at The Joint inside Hard Rock Hotel & Casino in Las Vegas at the end of the month, where the band will play 12 shows between October 31 and November 24. “Appetite For Democracy” will span the band’s biggest hits from their debut album “Appetite For Destruction” (1987) through “Chinese Democracy” (2008). 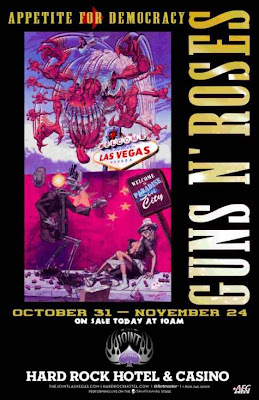 Exact details about the show are being kept under wraps but fans can expect the raw and gritty heavy metal Guns N’ Roses is known for along with a few surprise elements. Hard Rock Hotel & Casino is gearing up for the event by offering its guests one-of-a-kind drinks inspired by the band, and they’re available now through the last show on November 24. Available at The Joint, Vinyl and all casino bars, fans can enjoy their favorite spirits including vodka, rum, whiskey and more in six limited-time-only concoctions. Crafted by Hard Rock Hotel & Casino mixology experts, each signature libation was created from a culmination of various Guns N’ Roses songs and themes. Rock 'n' roll diehards can pay tribute to the legends by throwing back a "Liquid Dream Shot," which includes fruity hints of raspberry, pineapple, cherry and citrus with a sweet splash of vanilla. Bound to be a crowd favorite, "The Axl Rose," which honors the band's founder and frontman, puts a fancy twist on the iconic cranberry and vodka combination by topping the classic off with champagne.